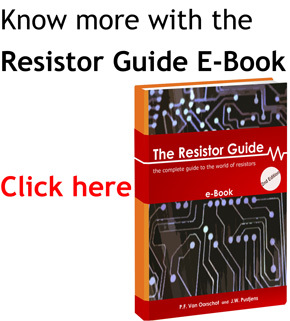 What is a braking resistor? The property of resistors to dissipate heat can be used to slow down a mechanical system. This process is called dynamic braking and such a resistor is called a dynamic braking resistor. To decelerate an electric motor, kinetic energy is transformed back into electrical energy. This energy is dissipated by using a power resistor. Dynamic braking can be rheostatic and regenerative. In rheostatic braking the energy is dissipated as heat in a resistor. In regenerative braking, the electric power is fed back in the system. The last option generally has a higher cost. Brake resistors are used for (small) motion systems, but also for large constructions such as trains or trams. A big advantage over friction braking systems is the lower wear and tear and faster deceleration. Brake resistors have relatively low ohmic values and a high power rating. Therefore, the wirewound resistor is a popular solution. Often they have a ceramic core and are fully welded. They are usually encased in a frame to create a safe distance to other parts. To increase dissipation capability, the frames are often executed with cooling fins, fans or even water cooling. Most DC motors will behave as generators as soon as they are removed from the power supply. This is due to their permanent magnets. The generated energy can be dissipated by connecting a power resistor as load. AC induction motors don’t have permanent magnets. In these motors, the rotating magnetic field in the stator induces a magnetic field. Braking resistors are used for applications where the motor speed exceeds the speed that is set by the variable frequency drive (VFD) or when fast deceleration is required. They can provide controlled braking at an increased torque. If the rotational velocity of the motor exceeds the synchronous velocity from the VFD, it will act as a generator. The surplus of energy will be fed into the VFD and increase the voltage on the DC bus. The larger the speed difference between the motor and the drive, the more energy will be fed back. It is important to correctly size a braking resistor. The lower the ohmic value of a resistor, the faster it can stop the motor and the more heat it generates. To compensate this, the resistor must be bigger or use a heat sink. The designer calculates the power rating of the resistor to stay under the temperature limits during braking. The resistance range is usually limited with a minimal value (to prevent over current) and a maximum value (for a low power dissipation capability). Stopping a train requires the dissipation of a lot of energy. Conventional disc brakes alone suffer from too much wear and maintenance. Dynamic braking is therefore often used as additional system. In dynamic train braking, the kinetic energy of the train is transformed into electric current at the traction motors of the locomotive. Often this system is additional to a friction braking system. 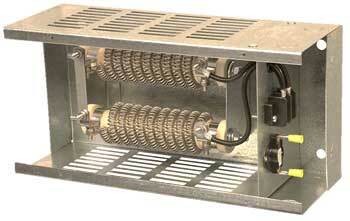 The generated current is dissipated under the locomotive carbody in large onboard banks of resistors. To protect the resistors, they are cooled by big air fans. Another protection system is thermal monitoring. Whenever the resistors become too hot, the train will switch to friction braking. Nowadays, most diesel trains are equipped with dynamic brakes, but in the past the system was used mainly in the mountains, where overheating on long descents caused overheating of the traditional brakes. When a train with dynamic brakes is passing by, one can hear the use of the brakes which make a humming sound.